I am fascinated by the different Google searches that bring people to my blog! For several months I have been considering picking out topics that landed those folks here and periodically writing about some of those. 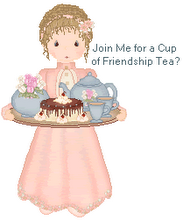 The most often searched for items that lands folks here is Friendship Tea. See the recipe posted on the right under the teapots. The search today that peeked my interest today was a search from Trowbridge, Wiltshire looking for "Scone Recipes National Trust Castle Drogo." So, how did they land on this Kentucky gal's Friendship Tea blog? In June when we returned from our visit to Britain I posted photos of our visit to the National Trust Castle Drogo in Devon. In an earlier post from that trip, I told that Sally Kirkland at The Olde Bakehouse Tea Room near Stanway gave me her recipe for scones. The scones look wonderful. Now I am hungry for a good scone. Love the picture of all your Tea pots on side bar.And I do like Scones. Mmmm I love a scone even without the cream!